Saved by the javelin-chucking tribe. And before anyone asks; No, a sword will NOT cut through mail, not riveted mail anyway. Not unless you extent the mail across a solid flat surface and strike it with all your strength. Speaking as someone who has taken a sword swing to the chest while wearing mail, it still hurts like the dickens. Oh man, I’m trying out HEMA for the first time next month, really exited about it. Richard saved his life and that’s the thanks he gets! The exchange between Roderick and Richard is magnificent. Like somebody had made a fighting treatise in the migration era and drew the combatants as animals and with modern style for some bizarre reason. For those unfamiliar with actual historical fighting, I’m referring to the way Roderick strikes with sword and shield together, so as to protect his otherwise vulnerable right hand/paw. 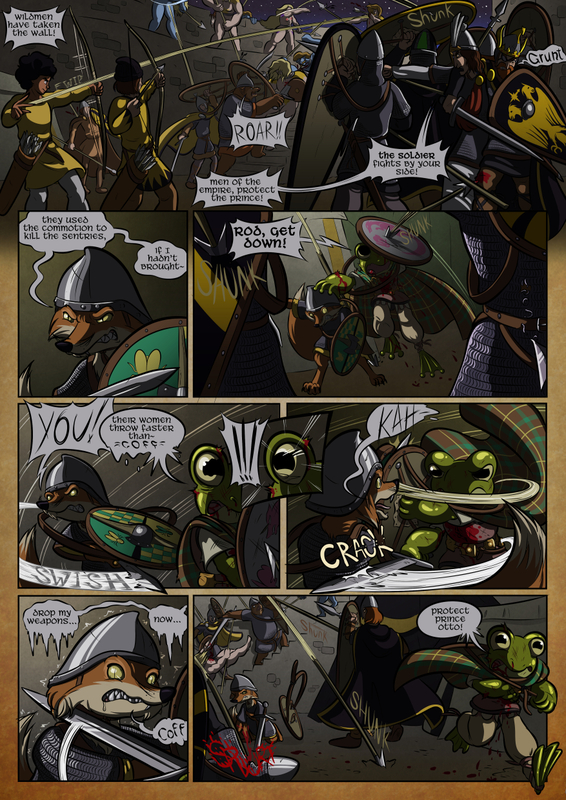 Richard’s response is surprisingly swift, given that he has his back turned and Roderick’s blow is about to land by the time he sees it coming, but the reaction – our protagonist uses his own shield to bind Roderick’s sword and shield arms, enabling the frog to strike with relave impunity – could have come straight out of a late medieval dueling manual. Forget what you’ve been taught by Hollywood. THIS is what a fight with sword and shield would have looked like. Striking under the shield to an opponent’s legs, as one of our heroines did a couple of pages ago, is also an effective tactic. Seriously, this comic is really good when it comes to the historical stuff. Even the magic stays true to migration period and medieval folklore! Real European history and folklore is a a major source of inspiration for this comic. I actually with I could fit in more sword & shield fights in the story, but 90% of opponents Richard faces are either monsters or supernatural.